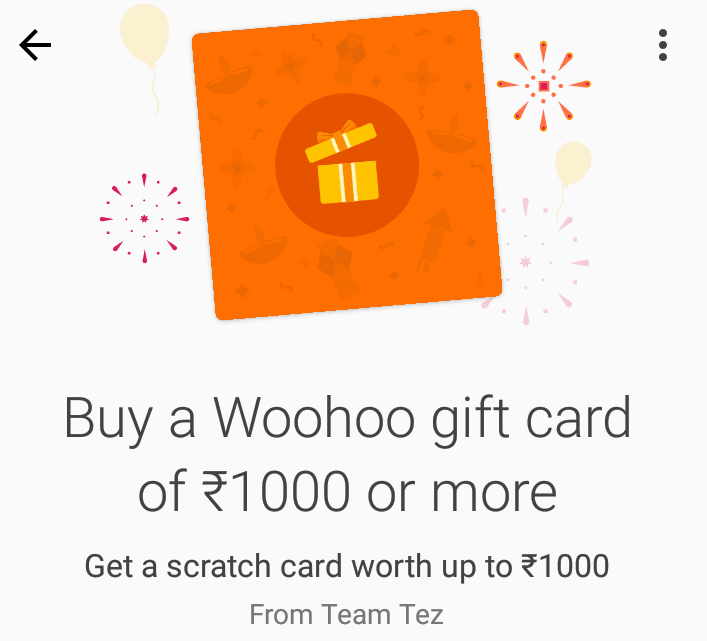 Woohoo App – Pay using Tez App and Get Rs 20-200 Cb from Woohoo + Rs 20-200 Tez Scratch card. How To Get Rs 20-200 Assured Cashback from Tez and Woohoo? Step 3: Also get a Tez cashback between Rs. 20 and Rs. 1000 directly to bank account. 2. 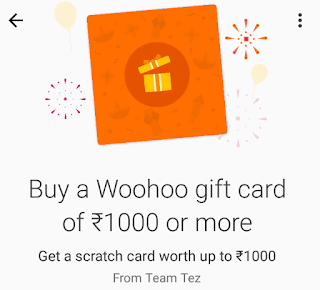 This promotion is jointly offered by Google Tez and Woohoo. 3. To avail this offer, customers must make a minimum purchase of Rs.1000 on woohoo.in or woohoo app using Google Tez as the payment method. 4. Customers will receive a digital scratch card from Google Tez ONLY for the first eligible order made using Google Tez during the offer period. 5. The Tez scratch card can be claimed in the Tez app and will entitle customers to a cashback amount of between Rs.20-Rs.1000. 8. Woohoo cashback will be disbursed ONLY once per every brand purchased. 9. If due to technical glitches and network issues the cashbacks from woohoo are not disbursed, woohoo and Tez will attempt to rectify the same in 20 working days. 10. Woohoo cashback will be disbursed in the form of Woohoo Loyalty Points and will be credited within 30 minutes of purchase to the customer’s registered Woohoo account. 11. The Woohoo cashbacks are not available for gift cards in the discounted cards section on woohoo.in and woohoo app. 12. Customers participating in the Tez offer will not be receiving cashbacks as part of Woohoo Gifting league. 13. The brands available under the offer, and the offer in its entirety can be withdrawn from woohoo.in and app on any day, and at any time, without any prior intimation. 14. This offer cannot be clubbed with any other offers currently available on www.woohoo.in. 15. Terms and Conditions are subject to change without prior notice at the sole discretion of Qwikcilver Solutions Private. Ltd.